The event begins at 8am. Breakfast will be served throughout the morning - and the 6th Avenue doors will open right out onto the sidewalk for a fantastic view of the balloons, floats, bands and celebrities! Gotham Hall, a Designated New York City Landmark, has hosted celebrities, dignitaries and US presidents. In its seven-story gilded ballroom, you'll feel like a celebrity too as you're treated to fine food and, right outside the entrance, a fantastic view of the world's most famous parade! Thanksgiving is one of the most popular times for visitors to the City, there being this “little” parade on Thursday morning. Not so “little” is the crowd that gathers along the parade route to watch the balloons, floats, bands and celebrities that make up the Macy’s Thanksgiving Day extravaganza. This year you can fulfill a "Bucket List" dream at a parade viewing party at one of the most iconic venues in Midtown Manhattan, Gotham Hall. A Designated New York City Landmark, Gotham Hall has welcomed dignitaries, US presidents, entertainers, and celebrities of all sorts. 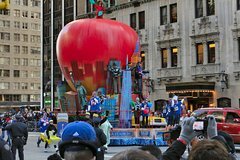 This Thanksgiving it will welcome you for a breakfast buffet, then you can step right outside to the sidewalk along the 6th Avenue parade route to view the world's most famous parade! As you enter Gotham Hall's Red Carpet Entryway and check your outerwear you'll feel like a celebrity as you enjoy a bountiful breakfast buffet in the seven-story gilded ballroom. You can watch the start of the parade on a huge projection screen, and then exit the venue right out onto the sidewalk along the Sixth Avenue parade route. You'll get an amazing view of the balloons, floats and bands as they pass right by you! You'll have unlimited access to Gotham Hall's facilities, including the buffet, during the entire parade. You can even watch the parade inside on the huge projection screen. To add to the festive atmosphere, Gotham Hall is located only 2 blocks from Macy's Herald Square where the live performances take place! If you choose you may even stroll down the street to join the crowds at the performance area.